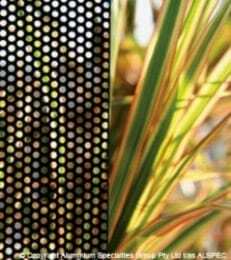 Xceed utilises a strong (2mm thickness), non corrosive aluminium sheet that is perforated and powder coated to an exacting standard. Xceed escapes tradition, free from mechanical fixings such as old fashioned screws and rivets. Instead Xceed employs 3M VHB high performance adhesive technology to create effortless strength. The acrylic chemistry of the 3M VHB adhesive delivers exceptional durability while its viscoelasticity provides superior energy absorbing properties that help to eliminate stress points. Our unique two-part wedge system has been designed to create the precise pressure required to activate the 3M VHB adhesive to its full potential. Both wedges are made from UV stabilised PVC to yield superior durability over time. Unlike screw-clamp or riveted systems, Xceed uses innovative technology that provides clear spacing between the stainless steel mesh and aluminium frame in order to eliminate the opportunity for galvanic corrosion, which occurs when dissimilar metals contact. Xceed’s extruded aluminium frame system is crafted to deliver a lightweight solution without compromising on strength. The frame features gold accredited Interpon™ powdercoating that delivers a durable finish in a versatile range of colours including the latest Colorbond™ colours. Solid aluminium stakes are used to fortify each corner join, providing Xceed with steadfast strength. As a statement of strength, Xceed hinged doors are characterised by our integrated three-point locking system as standard.